Goths In Hot Weather ©: More Goth, vicar? Grr!, originally uploaded by fuzzirella. Fuzzirella and her chums are making the most of their visit to Bat's Day. 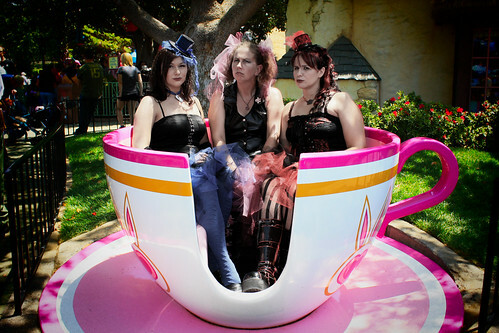 Clearly well versed in irony, these clever Gothettes manage to combine sullen loneliness with sitting in a giant spinning teacup. No easy feat, but watch those bare arms darklings - hopefully they're wearing factor 451. The one in the middle appears to be getting older and more wizened as you look at the picture. The evil daystar strikes again. I see your point, Phil. Perhaps we've unwittingly stumbled upon the fabled Picture of Dorian Goth! I wish I had something more clever to say. Ha ha, I love this picture. It looks like something out of Alice in Wonderland. I came across this video today. Hehe, made me chuckle. Love the dour looks on all of em. Oh thank JAYZUS that pink is the new black, isn't it?